For the last six years the Liberals have imposed brutal policies against refugees. On the eve of the election they were still stirring up racism and fear. Morrison and Dutton claimed refugees brought here for medical treatment from Manus and Nauru could be rapists and murderers, as they wasted $185 million reopening Christmas Island to stage a press conference. Dutton and Morrison scapegoated refugees, saying anyone brought from Manus and Nauru for medical treatment would kick Australians off hospital queues. The racist attack that killed 50 Muslims in Christchurch was a shock—but not a surprise. Racism has been made acceptable in the mainstream by politicians like Scott Morrison, Tony Abbott and Peter Dutton. They have demonised Muslims and refugees as potential terrorists and a threat. 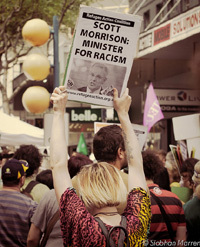 In the aftermath of Christchurch Scott Morrison has tried to distance himself from racism and the far right. But he has created the climate in which such ideas can fester and grow. It’s time to kick him out. Labor remains the favourite to win the election. Labor leader Bill Shorten has claimed he would get everyone off Manus and Nauru. But he has refused to commit to bringing them to Australia. Instead he says he would strike deals with third countries to resettle them. But Shorten has admitted he has no countries willing to take them. The Liberals have been trying to negotiate similar deals for over five years and failed. There are still 915 refugees and asylum seekers on Manus and Nauru. Two and half years after the announcement of the US deal only 508 people have flown to the US for resettlement. The deal is almost exhausted with many refused by the US. Another 953 people have been moved to Australia for medical care but remain barred from permanent resettlement. New Zealand has offered to resettle only 150 people a year. This means hundreds will be left behind on the offshore islands. Labor has no solution to resettle the rest of the refugees and asylum seekers who are still in limbo after almost six years of offshore detention. Whoever wins the election, we will need to keep campaigning to #BringThemHere and close the offshore camps. This is the only way to end the torture on Manus and Nauru. The Medivac Bill became law on 1 March. The Bill provides for sick people on Manus and Nauru to be transferred to Australia for ‘treatment or assessment’ on the advice of two treating doctors. After someone is referred for transfer, the Minister has 72 hours to assess the request. If the Minister refuses, the case is referred for review to an independent medical panel that has the power to override the Minister’s decision. The Minister can only veto a transfer on security grounds, or if the Minister knows the patient has a substantial criminal record. After the Bill was carried, in a fit of pique, Morrison announced that the Christmas Island detention centre would be re-opened and anyone transferred from Manus or Nauru would be sent there. But so far, exactly no one has been transferred and the budget announced that that the Coalition government, if elected, would repeal the Medivac Bill and close Christmas Island! Re-opening Christmas Island cost $185 million, an unbelievably expensive media stunt for the election. The Bill was a major blow against the Morrison government. The Bill was moved by a group of Independents and Greens, and was backed by Labor. The Coalition had deliberately blocked sick people on Manus and Nauru getting treatment for years, as part of their deterrence policy. The Bill potentially unlocks the government’s medical blockade. But so far, only one person is known to have been transferred from offshore detention under the Medivac Bill. Hundreds of sick people need treatment and/or assessment. But it is now very obvious that the Bill is no guarantee that people will get off Manus and Nauru. The movement has to maintain its unconditional demand to end offshore detention and bring all refugees and asylum seekers to the mainland. In 2001, in the run up to the election, John Howard sent the SAS onto to the Tampa to stop 433 refugees reaching Australia. Many people attributed Howard’s election victory to this effort to play the race card against refugees. The Liberals have used the issue in an effort to win votes ever since, with the Labor Party tailing along. But Scott Morrison’s $185 million spent reopening Christmas Island detention centre has not had the same effect. This forum will discuss whether racism against refugees shifts election results and how we can stop racism being used for electoral gain.